An astronaut who looks like Freddie Mercury fighting off aliens who look like they’re made of lime jelly? Yep, sounds like standard slots fare to me. 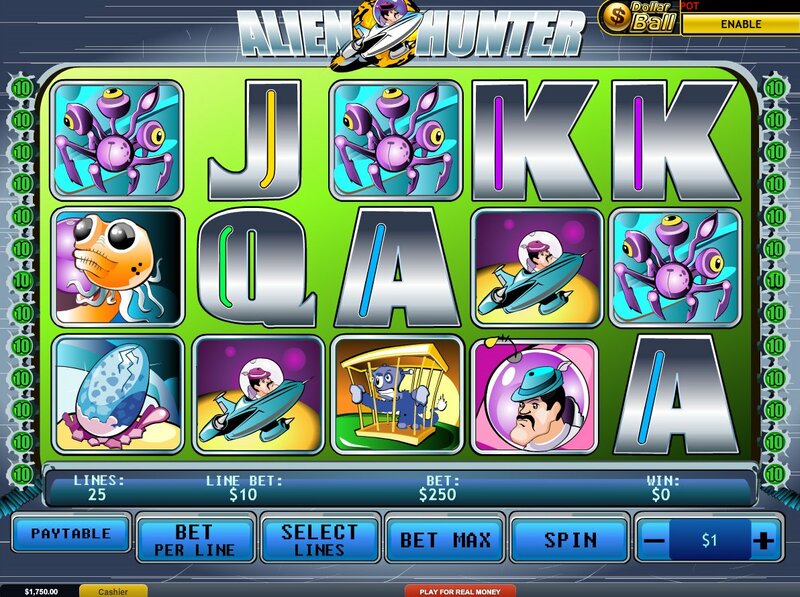 Prolific slot developer Playtech’s sci-fi themed slot, Alien Hunter, certainly won’t win any beauty competitions any time soon, but in terms of generous bonuses it delivers. A 5-reel, 25-payline slot, Alien Hunter sees our Mercury-esque astronaut (en route to Mercury, presumably) mixing things up on the reels alongside an alien dog, several different-colored aliens, plus some chrome effects 10-through-Ace symbols. The caged alien doggy is the game’s Wild, and substitutes for all regular symbols in the game other than the Scatters and Bonus icons. Five Wilds pays a rather sweet jackpot of 10,000x your line bet. Our mustachioed space hero is the game’s first Bonus Scatter, and three or more of him anywhere on the reels triggers a Alien Hunter Spaceship Free Spins Bonus. Three Scatters triggers five spins, four Scatters 10 spins, and five Scatters a top whack of 25 free spins. There’s no multiplier attached, but the spins can be re-triggered. Blue alien egg bonus symbols trigger the game’s second extra feature. Scatters appear on reels 1 and 5 only, but when they do appear you’ll trigger a Pick ‘Em Bonus round where you have to choose eggs until you find the alien. 720 coins are up for grabs here. Finally, three or more pink Alien Hunter icons on Reels 2, 3 and 4 triggers a nice arcade mode with a little skill involved. You’ll have 15 seconds to shoot down six aliens – the more you shoot, you more cash you win. Hitting three Scatters on three specific reels is always tough, and it’s pretty hard to activate, but at least there are plenty of other bonus features on offer to compensate. Get into the Orbit of This Progressive Jackpot! As if three bonus rounds of varying interest levels isn’t enough for you, Alien Hunter offers a progressive jackpot for five dollar ball symbols across the reels. Just four symbols, however, will award an amount of 10 percent the progressive jackpot. 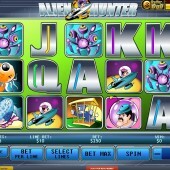 For fans of outer space slots mayhem, Alien Hunter certainly delivers. It won’t win any prizes for looks, but if you’ve had a taste of games like Sheriff Gaming’s fun robot-sitcom, The Robets, or the sheer wackiness of NetEnt’s space-age Starburst, you should get a kick out of this.